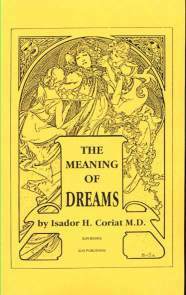 THE MEANING OF DREAMS by Isador H. Coriat, M.D. The Problem of Dreams, An Example of Dream- Analysis, Dreams as the Fulfillment of Wishes, The Unconscious, The Mechanism and Function of Dreams, Dreams of Children, Typical, Prophetic, and Artificial Dreams, Dreams and Nervous Diseases. 194 pgs. 5x8. Paperback. ISBN: 0-89540-313-7. $17.00.